My daughter had a fever today so I took my two sons out to lunch. Sitting at lunch I couldn't help thinking about what a blessing it is to be a father. And then, as fate would have it, my father walked into the restaurant and sat down at the booth behind us for a business meeting. I overheard my father's business associate comment that I am a "spitting image" of him, which is funny because I'm always being told that one of my sons is a "spitting image" of me. There truly is something so special about fatherhood. And I was thinking about it earlier in the week as well when I attended a retreat for Jewish educators at the Butzel Conference Center in Ortonville, Michigan. One of the speakers was Jonah Geller, the Executive director of Tamarack Camps, where I serve as the rabbi. Jonah spoke on the topic of "implementing change" and first asked us to list the five biggest changes in our lives. The biggest change in my life that I listed first was becoming a father. More than becoming a rabbi or getting married, and more than losing close relatives, this life-changing event was the most significant in my life thus far. Since becoming a dad almost five-and-a-half years ago, my life has certainly been different in the most positive way. Having dependents is certainly a monumental responsibility and a life-changing realization. I've also found it wonderful to have children whom I also consider to be friends. The enjoyment and pride that a father receives from just looking at his children is such a blessing. I often hear women lament that there shouldn't be just one day called "Mothers' Day" but rather every day should be devoted to heaping praise on hard-working moms. I agree. I feel the same way about "Fathers' Day" too. It seems silly that one day a year, my kids should feel the need to honor me for the job of being their father. I have come to see Fathers' Day (this Sunday) as a day not for my children to leave me alone and let me play golf, but rather as a day in which I make a concerted effort to thank God for the gift of fatherhood... a day in which I take the time to express my gratitude for my children. So, if Hallmark can sell more cards and stores can increase their revenue by advertising gifts for dads so be it. For me, Fathers' Day is a day for reflection and appreciation. There are some wonderful books on fatherhood that [coincidentally?] have been published recently. American Parent: My Strange and Surprising Adventures in Modern Babyland is by one of my favorite authors, Sam Apple. In September 2007, I wrote on this blog about Sam's brilliantly funny article in Parents Magazine. 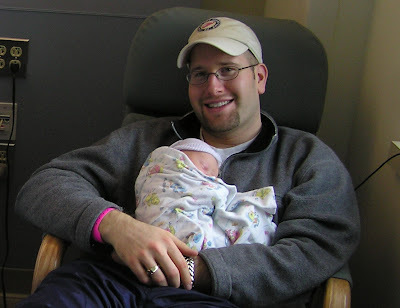 Since he became a father, Sam has written many hilarious pieces about the joys and challenges of parenthood. In American Parent, he visits with the mohel who circumcised him, enters a trance with a childbirth hypnotist, goes on a stakeout with a nanny spy, and attends a lecture on Botox for new mothers. Sam, a University of Michigan graduate, is the son of legendary author Max Apple. After having a son a couple years ago, he and his wife added twins to the family so maybe I can give him some fatherhood advice in that regard. 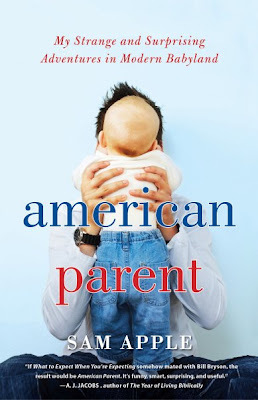 Excerpts from American Parent are available on Sam Apple's website. I learned that another one of my favorite authors, Michael Lewis, would have a book on fatherhood coming out from his appearance on the Daily Show with Jon Stewart last week. The author of Bringing Down the House and Money Ball has written about fatherhood in Home Game: An Accidental Guide to Fatherhood. The book is adapted from a series of Slate essays that Lewis wrote about what actually happened immediately after the birth of each of his three children. He's a gifted writer and the book is very funny and engaging. 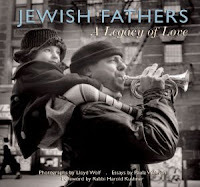 A book about fatherhood that I've had for several years is Lloyd Wolf's Jewish Fathers: A Legacy of Love. It's published by Jewish Lights, which is hands down my favorite Jewish book publisher. The book is a collection of stories and photographs celebrating the lives of contemporary American Jewish fathers. Wolf writes, "The image of the Jewish father is synonymous with the Yiddish word mensch, a good, kind, decent, human being. The word mensch has become part of America’s vocabulary. The first mensch that we meet in life is usually our father. Honest. Hardworking. Fair. Charitable. Funny. Reverent. Honorable. Responsible. A mensch. It is a standard to be lived up to, a standard that Jewish fathers have been charged with since the times of the Biblical patriarchs, Abraham, Isaac and Jacob." Finally, I found Adam Dickter's essay on Fatherhood to be quite meaningful. In the NY Jewish Week's blog, Dickter writes about his own experience as a father of three children. He quotes Adam Nimoy, who writes that his famous father, Leonard Nimoy "worked diligently, sometimes obsessively, to provide for his family, but like the stoic but efficient Spock character he played on TV, didn’t put much stock in bonding." Dickter's impression is that "Adam would have preferred a dad who swept floors and had time to go to ballgames." It's not always easy to give 100% to the job of being a father. But it is so important to try. Fatherhood is the greatest gift! So, to all the fathers and grandfathers (and great-grandfathers) out there, please accept my own wishes for a Happy Fathers' Day. I'm proud to be part of this club and I know that while "Fathers' Day" is the official day to celebrate us dads, everyday is an honor to serve in this special role.